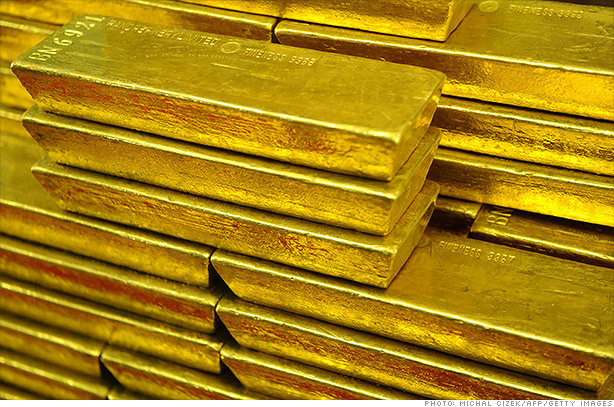 Gold prices dropped 1% Thursday. Gold prices dropped more than 1% Thursday and currently hover around $1,377 an ounce. Gold prices have been rocky all year. After years of moving higher, gold prices are now down nearly 30% from all-time highs above $1,900 an ounce hit in mid-2011. While gold bulls are often the most vociferous in their defense of the metal's enduring value, talk of a sharp fall in gold prices easily spooks investors. Societe General's commodity analysts think gold could hit $1,150 in 2014 as investors rush out of their gold ETF holdings at a faster pace. The SPDR Gold Shares Trust fell 1% Thursday and is down nearly 18% this year. Soc Gen's analysts said gold has been in a long-term bubble as inflation wary investors plowed into the precious metal as a hedge. Now that inflation concerns have ebbed, investors, they say, will sell out. Other traders on StockTwits see technical reasons to bet on a gold sell-off. Ah yes, lest we forget the Fed. That's what's causing all the market gyrations around the globe. The $64,000 question: When will they start tapering? Still not all traders on StockTwits were quite as bearish. As market strategist Jon Boorman notes, gold is always a hot topic.